This entry was posted in ISSER - University of Ghana and tagged Africa, Electric Power Grid, Electricity, Energy, Energy Efficiency, Ghana, Infrastructure, Planning, Policy, Power Sector, Regulation, Reliability, Renewable energy, Sub-Saharan Africa, Urban Energy Transitions on August 22, 2014 by danielkerrucl. How to Evaluate the Impact of Research Projects? Xavier Lemaire and Daniel Kerr from University College London attended the first annual workshop of the Understanding Sustainable Energy Solutions (USES) Network, held at the Wellcome Trust, London, UK on the 8th July 2014. The workshop was designed to give insights into how best to achieve impact and engagement with beneficiaries in the USES Network projects, which cover a wide variety of aspects of low carbon energy research in developing countries, from institutional networking assistance and business support, to technology dissemination for thermal and electrical energy, to institutional and residential energy efficiency. A number of sessions took place, with an aim to convey insights into how funders and research users engage with academic institutions and organisations conducting research; theories of change and the impacts, both potential and real, that past projects have achieved/failed to achieve; and how best to plan for and assess the impact of the USES projects, and what shared experiences could be brought to bear for the good of all involved projects. The day began with three presentations on impact, engagement and theories of change. Ed Brown from Loughborough University, in conjunction with Alison Mohr from the University of Nottingham, led off with an introduction to the Participatory Impact Assessment (PIPA) methodology. Adrian Ely from the STEPs Centre at the University of Sussex, and Duncan Green from Oxfam also contributed via video presentations. Of particular interest was the PIPA methodology for assessing impact, which seeks to identify the inter-linkages in the goals and priorities of all actors in research projects, for example funding agencies, research institutions, local and national governments, community organisations, NGOs and the wider population. Through identifying the synergies in these groups’ priorities and needs, the methodology hopes to provide a clearer insight into the potential impacts of research projects, and the methods needed to achieve them. 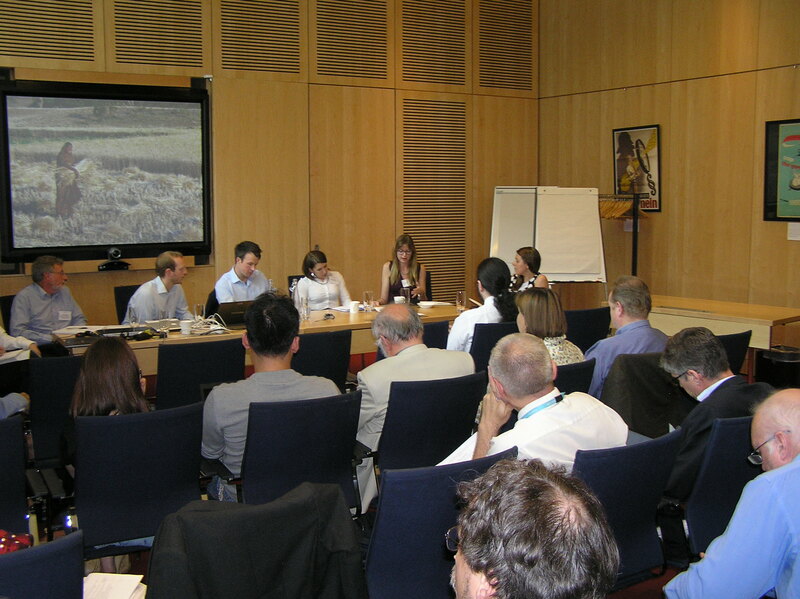 The following session saw a number of representatives from the Department for International Development and the Department for Energy and Climate Change, as well as the UKCDS and the Knowledge Transfer Network, conduct a roundtable discussion on the experiences of funding agencies and other organisations in engaging with research and researchers. Broad themes included the importance of quantitative measures of impact and results in the view of the funders and their objectives, as well as highlighting the divergence on timescales for results between public sector projects and research projects. The whole-room discussions sessions that followed, as well as in the case study presentations, brought forward a number of recurring points. The importance of stakeholder engagement from the very beginning of a project in achieving impact in research projects, particularly in developing country contexts, was consistently highlighted as a key factor. In-depth knowledge of local country contexts, as well as sectoral expertise in key project members, was identified as a useful factor in achieving project impacts. These factors, along with the targeting of invitations to actors based on their expertise, were also identified to be critical in the creation, funding and initial engagement of projects. The final session focused on the proposed framework for reporting project impacts to DFID, and how shared experiences within the USES project could help to facilitate greater impacts for all involved projects. Finally, the day concluded with contributions from participants on how the USES network can support the involved projects, predominantly focusing around networking via social media and web networking spaces provided through the USES portal on the LCEDN website. This entry was posted in UCL - Energy Institute and tagged Capacity Building, DECC, DFID, Energy, Energy Efficiency, Engagement, EPSRC, Impact, Infrastructure, LCEDN, PIPA Methodology, Planning, RCUK, Stakeholder, Sustainable Energy, UCL, USES Network, Workshop on August 8, 2014 by danielkerrucl.